Located in the John Day Valley on the bank of the Middle Fork of the John Day River, Ritter Hot Springs is a fantastic destination for all those who want a secluded and remote place to relax and enjoy the beautiful scenery of the high desert of Eastern Oregon. The source of natural hot springs and bathhouse are located on the other side of the river and can be reached via a suspension bridge leading up to a hillside. After crossing the bridge, walk up approximately a hundred yards to a concrete structure that built from cinder blocks. The enclosed source is situated near the bathhouse. The geothermal water comes out from the ground at 109°F and by gravity flows to the soaking tubs; tubs can hold two or three persons. One of the tubs is open towards the sky but enclosed from all other directions to maintain privacy. 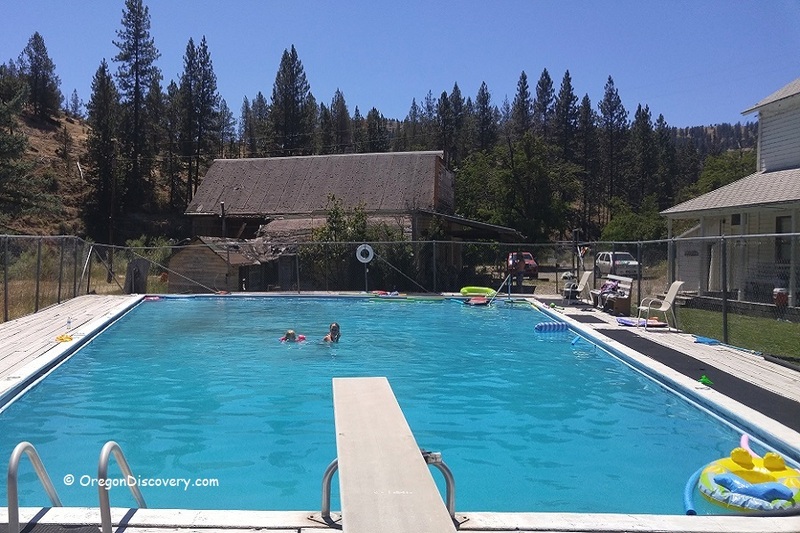 Also, the hot springs water is piped across the Middle Fork of the John Day River into a swimming pool that is 40 feet wide, 60 feet long, with a maximum depth of 6 feet. The pool is maintained at a comfortable temperature of 80-85°F which is good enough to enjoy summer swimming and soaking. There are a lot of toys in the pool to play with your kids. With the large flow and high water alkalinity, no treatment with chlorine is required. Swimsuits are optional in the private tubs but required in the public pool. Next, to the river, you will find a single pipe wrench - a powerful shower that provides excellent neck and shoulders massages. Ritter is open for day-use and overnight guests. 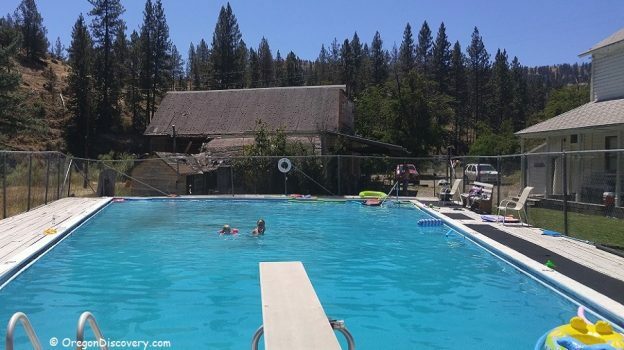 The facility offers eight rooms in the rustic hotel with shared bath, two cabins, RV and tent campsite. There are restrooms and shower in the changing area for day-use guests. 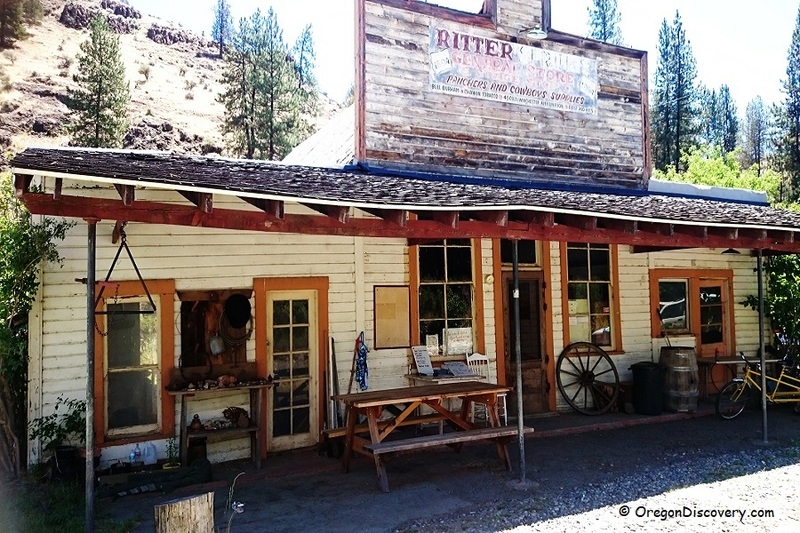 Ritter Hot Springs does not sell any food, so bring your own food and cook at Ritter. Microwave, refrigerator, freezer, gas grill are available. No alcohol is allowed on the property. Ritter is a seasonal facility and opens from Memorial Day to Labor Day each year. Due to the local community is primarily Seventh-day Adventist, the pool is closed from sundown on Friday to sundown on Saturday in observance of the Sabbath. Ritter visitors can also enjoy activities such as fishing, swimming, hiking a rock collecting. Rockhounding will be thrilled with the plethora of zeolites found in the area including heulandite, chabazite, analcime, stilbite, and apophyllite. The hot springs were discovered in the 1850s by William Neal McDuffee. This discovery was related to an accident that could become fatal for him. He almost froze to death after falling through ice on the frozen river. The fortunate finding of steaming hot water nearby saved his life. Soon McDuffee filed a land claim and established a resort. Still, one of the McDuffee's original cabins remains on the site. Years later, W.McDuffee shot a man on the property and was sent to prison. Originally named McDuffee, later the hot springs were renamed to Ritter Hot Springs after Joseph Ritter - a famous person in the region. He was an owner of the ranch near the hot springs and established the post office in his house. The first wooden structures were built in 1886 but later destroyed by a fire. 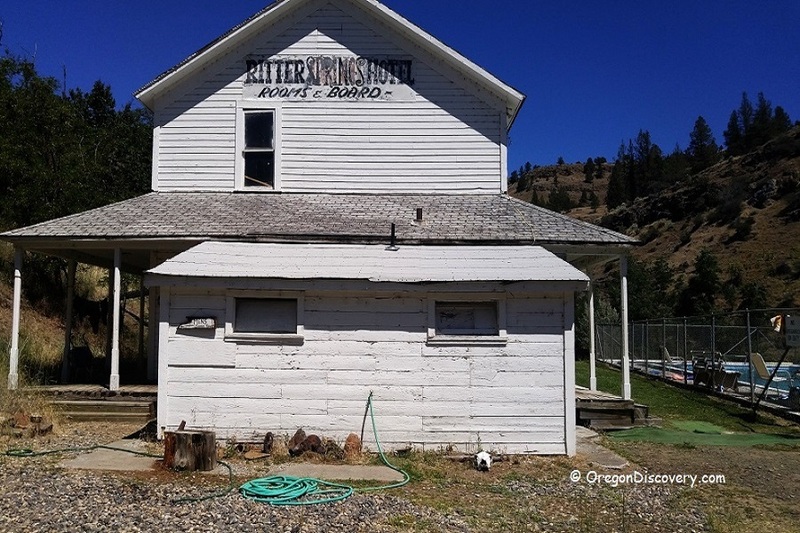 Surprisingly that a building of the General Store, constructed in 1894, still stands as historical evidence of the old time, time of settlers and cowboys. The two-story Ritter Hotel was built in 1905. The first floor was used for guests' accommodation and the second floor was a place for meetings and dancing parties. 293 miles east of Portland. 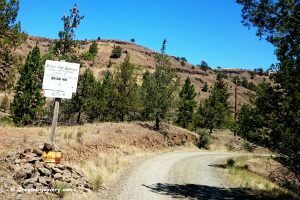 Continue 10 miles on Ritter Road, go across the river's bridge and after 0.2 miles, turn right onto a gravel road and drive to the destination.